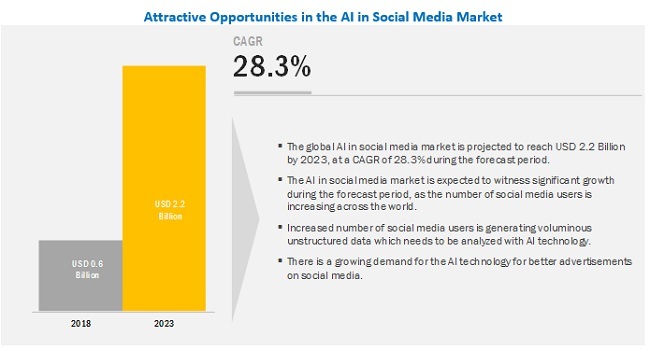 [179 Pages Report] The global AI in social media market to grow from 465.2 million in 2017 to USD 2,197.1 million by 2023, at a Compound Annual Growth Rate (CAGR) of 28.3%. The base year considered for the study is 2017 and the forecast period is 2018–2023. The increasing adoption of the Artificial Intelligence (AI) technology for various applications in the social media sector and utilization of AI-enabled smartphones are expected to drive the growth of the market. The objective of the report is to define, describe, and forecast the size of the AI in social media market on the basis of technologies, applications, components (solutions and services), enterprise size, and regions. The report also aims at providing detailed information about the major factors, such as drivers, restraints, opportunities, and challenges, influencing the growth of the market. The major AI in social media vendors include Google (US), Facebook (US), AWS (US), IBM (US), Adobe Systems (US), Baidu (China), Salesforce (US), Twitter (US), Snap (US), Clarabridge (US), Converseon (US), Sprinklr (US), Unmetric (US), ISentium (US), Cluep (US), Netbase (US), Spredfast (US), Synthesio (US), Crimson Heaxagon (US), Hootsuite (CANADA), Sprout Social (US), Vidora (US), Meltwater (US), and Talkwalker (Luxembourg). MarketsandMarkets forecasts the global Artificial Intelligence (AI) in social media market to grow from 633.1 million in 2018 to USD 2,197.1 million by 2023, at a Compound Annual Growth Rate (CAGR) of 28.3% during the forecast period. The increasing adoption of AI for various applications in the social media sector and the utilization of the AI technology for effective advertising campaigns on social media platforms are expected to drive the growth of the AI in social media market. Among technologies, the Natural Language Processing (NLP) segment is expected to grow at a higher CAGR during the forecast period. As the NLP technology helps in reading social media content and understanding human languages from various social media platforms, it is being rapidly utilized by social media enterprises. On the basis of components, the AI in social media market has been segmented into solutions and services. The services segment is expected to grow at a higher CAGR during the forecast period. The growing awareness among social media enterprises regarding the features and benefits of the AI technology in the social media industry, increasing adoption of the AI technology for various applications in the social media sector, and rising utilization of AI-enabled smartphones are expected to drive the global market. Based on applications, the AI in social media market is segmented into sales and marketing, customer experience management, and predictive risk assessment. The sales and marketing segment is expected to have the largest market size during the forecast period. Due to the increasing social media users in the Asia Pacific (APAC) region, the adoption of sales and marketing applications is expected to increase at a rapid pace, as they provide better customer services. Among enterprises, the Small and Medium-sized Enterprises (SMEs) segment is expected to grow at a higher CAGR during the forecast period. The increasing demand for the integration of the AI technology in the social media sector is expected to have accelerated the growth of the SMEs. North America is expected to have the largest market size in the AI in social media market, while APAC is expected to grow at the highest CAGR during the forecast period. The North American region has shown increased investments in the market. A considerable growth is expected in the region during the forecast period. In North America, the AI in social media technologies is effectively used for various applications, such as sales and marketing, customer experience management, and predictive risk assessment. The AI in social media market faces many challenges; for instance, the lack of standards to manage the increasing unstructured data that may generate data privacy issues in AI in social media solutions and the limited number of AI experts are restraining the growth of the market. The major vendors who offer AI in social media solutions across the globe include Google (US), Facebook (US), AWS (US), IBM (US), Adobe Systems (US), Baidu (China), Salesforce (US), Twitter (US), Snap (US), Clarabridge (US), Converseon (US), Sprinklr (US), Unmetric (US), ISentium (US), Cluep (US), Netbase (US), Spredfast (US), Synthesio (US), Crimson Heaxagon (US), Hootsuite (Canada), Sprout Social (US), Vidora (US), Meltwater (US), and Talkwalker (Luxembourg). 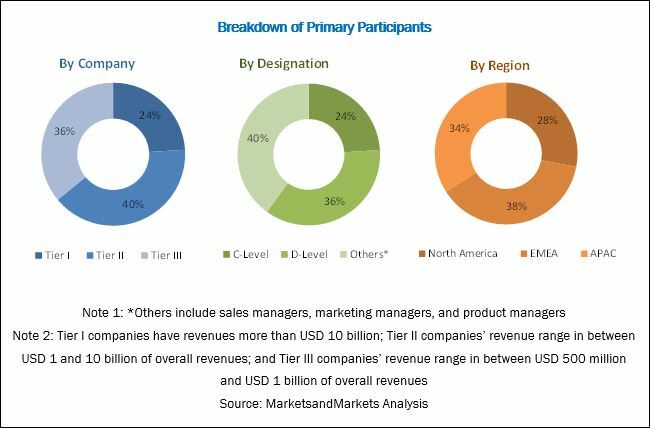 These vendors have adopted different types of organic and inorganic growth strategies, such as new product launches, partnerships and collaborations, and mergers and acquisitions, to expand their presence in the AI in social media market.